"A vegan version of an old classic. Meaty marinated portobellos give this dish the taste and mouth-feel of the original." Whisk vegan sour cream, 1/2 cup water, minced onion, flour, vegan bouillon, garlic powder, basil, and black pepper in a bowl. Cover and refrigerate. What's cooking in Dana Point? Connie's "Sure to Fool 'Em" Stuffed Shells. I use Edward & Sons Not-Beef bouillon. Serve with cooked bow-tie pasta. My vegan son loved this! 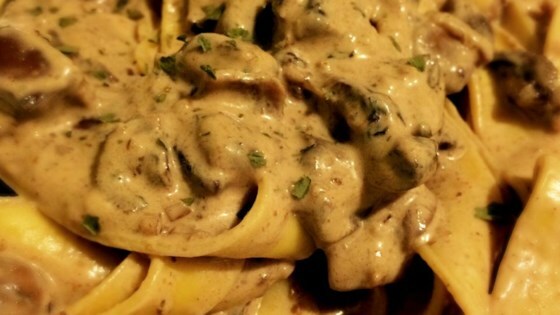 I added about 3 tablespoons of the liquid from the mushrooms into the sauce and it made a huge difference. I forgot the flour but it was still AMAZING. My meat loving family said it was hit! A definite repeat. I highly recommend this dish over tri-colored quinoa.